What is the summer house? I can tell you what it means to me – it’s not just one thing! It’s a school, a fear, a resting point, a home and playground too. 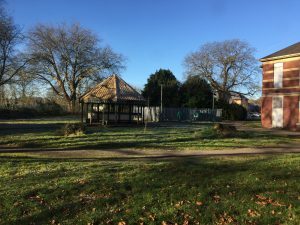 A community, a smoking shelter and a sanctuary for who? The summer house outside Ward West 1A, photo taken by Tim. A School – I remember – warm sunny days, green trees, excitement at my new job and getting a qualification at the end of it. Some of my learning on placement took place in the summer house. Debates and discussion with different members of the clinical team, nurses, psychologists, psychiatrists, OTs and social workers. Books, pens and note pads – patients as case studies, illness and diagnosis, treatments with talking, with medication with ECT, psychiatry, psychology – a bewildering array of topics and subjects. What a place to learn! This was my classroom for a brief period of time. A Fear – someone is missing from the ward or failed to return from leave – a search needs to be undertaken. If there was any suicide risk we were told to look up into the trees, just in case. Check the summer house – under the benches, around each corner, look up, and check on top also. Fortunately for me and gladly for the patients that were missing – I never did find anyone who had committed suicide. It remained a fear of mine until we left Whitchurch, the thoughts remain with me even now that I no longer work there. A resting point – for the years I worked in Tegfan day hospital, in the grounds of Whitchurch, one of the summer houses provided a midpoint between both buildings. On our zigzag journeys, around the site, this was frequently a resting point for those with physical disabilities to stop and rest – for others it was a point to sit and have a cigarette. This was always a social occasion of those gathered – one thing in common, the hospital. Patient, staff or visitor, there was a draw to sit and stop. Was this truly asylum – inclusion, acceptance and safety? 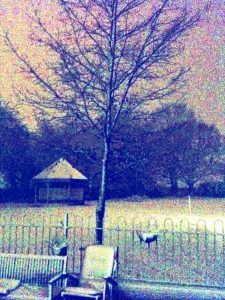 A home and a play ground – during my time on nights, I saw the summer house provided a playground for the wild life of the hospital – foxes, rabbits, squirrels, wood pigeons and magpies proliferate as do the bats and may bugs. At one time a place for the feral cats too. Moths and all manner of insects – making it their home, their living room, their bedroom, their dining room, their bathroom and their playground. A Community – they have formed throughout my 33 years a community meeting place, not just for people of the hospital but for the general community too. Dog walkers, wanderers and especially kids – another resting place, a chatting shop, a play ground, a teenage lovers lane, a drug den for sales and use of illicit substances, a pub for underage drinking and smoking. 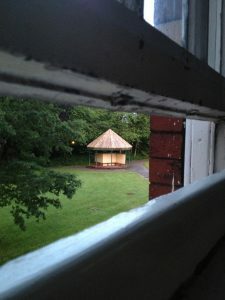 A smoking shelter – with the implementation of smoking bans the summer house became an illicit smoking shelter – staff would congregate, smoke, chat, catch up on the gossip of their own and especially others lives, arrange nights out, disclose personal achievements and failures, seeking support and kindness. A personal sanctuary – This is where through 33 years I’d sit and contemplate life, and from this make life decisions and consider how to handle situations that weren’t in my control – to begin with were my thoughts about psychiatry, personal issues of career plans, relationship plans and relationship ends, either of my making or those made by others. These summer houses know all my life secrets, and I trust that the details will never be shared. They were and still are my sanctuary, my friend and my confidante. My last resting point after my very last 12 hour night shift at Whitchurch, was the summer house. I sat, lit a cigarette and reflected on 33 years – I saw myself and my colleagues and friends, through the decades – some no longer with us – but they were there with me for that final resting point. Also came to mind my family, friends and relationships – they were present with me too. I could see and hear them; they along with my memories above are my summer house, my special place.